Women of Troy is a stunningly beautiful performance, introducing a new phase for the changing face of Georgian theatre. Directed by one of the most exciting of the country’s young generation of theatre practitioners, the play is an attempt to analyse and somehow comprehend the atrocities perpetrated in the numerous wars that the country has suffered in the last forty years. 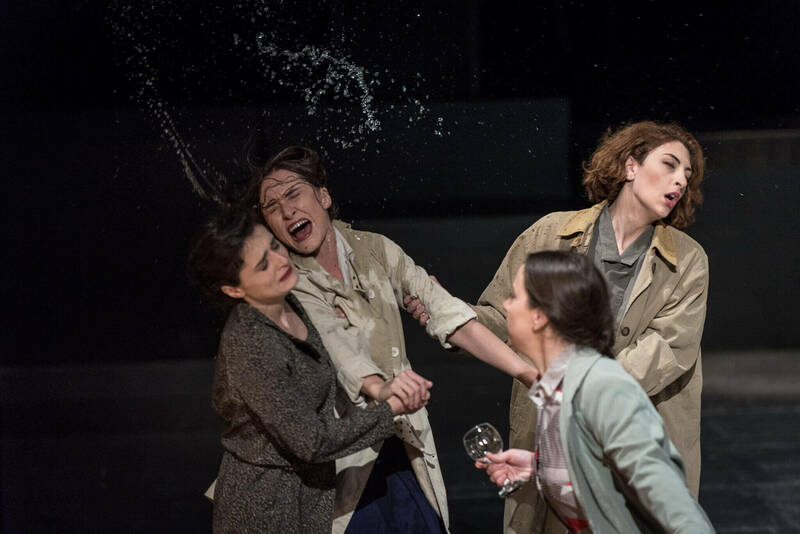 Both the director and the dramaturg have taken Euripides’ tragedy as the starting point for the true life accounts volunteered by Georgian women who offered to talk frankly about their struggle to survive during wartime. They are no longer shushed or ignored. 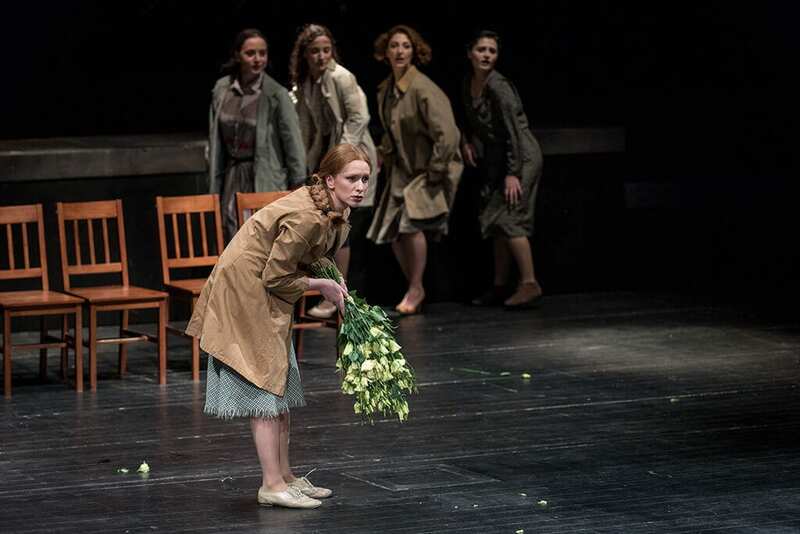 Instead the play aims to give voice to Georgia’s unsung heroines in the post-Soviet era. Intimacy is the primary and one of the most important characteristics of the production. 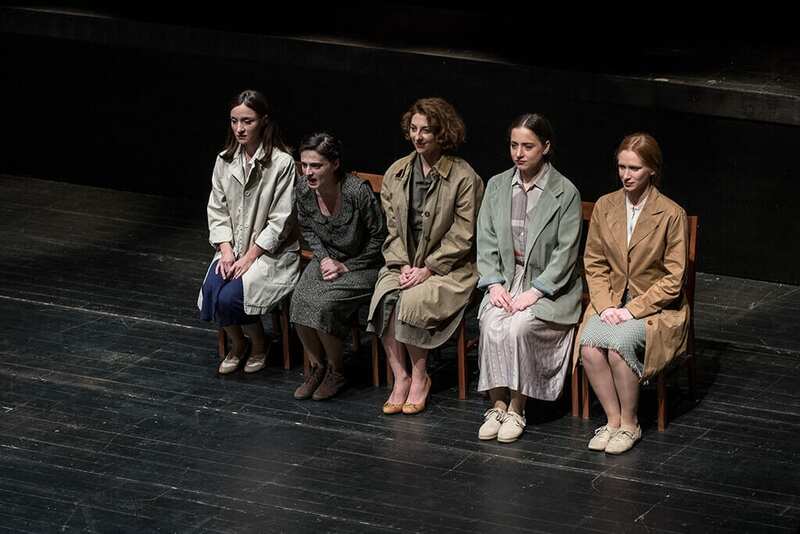 There is no evident barrier between the five young actresses and the audience who sit in close proximity to performance space. Moreover, the women very often talk directly to the audience and, as such, they themselves become the audience at times. 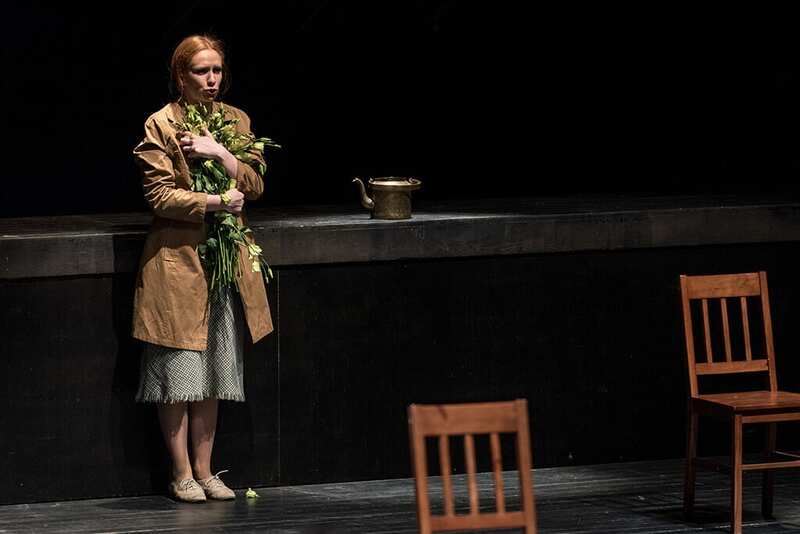 None of the young actresses in the production had first hand experience of the atrocities they encounter on stage, and thus do not try to play or portray the real survivors. Instead, they attempt to experience the war through the words and memories of the performance just like the audience do. The set design is simple. Apart from five chairs, two vases of white flowers and a small table with a water jug and glasses, there are no props or set decoration. To be honest nothing else is really needed. Focus is solely on the women, their voices and their bodies. The musicality of the performance is outstanding as the director, Data Tavadze, pays a lot of attention to the meaning of each sound. The women’s voices blend into perfection, creating a homogenous narrative divided into individual stories. However, it is not only the voices in Women of Troy that are important. The sound of birds singing which opens and closes the performance emphasizes a never-ending cycle of life. 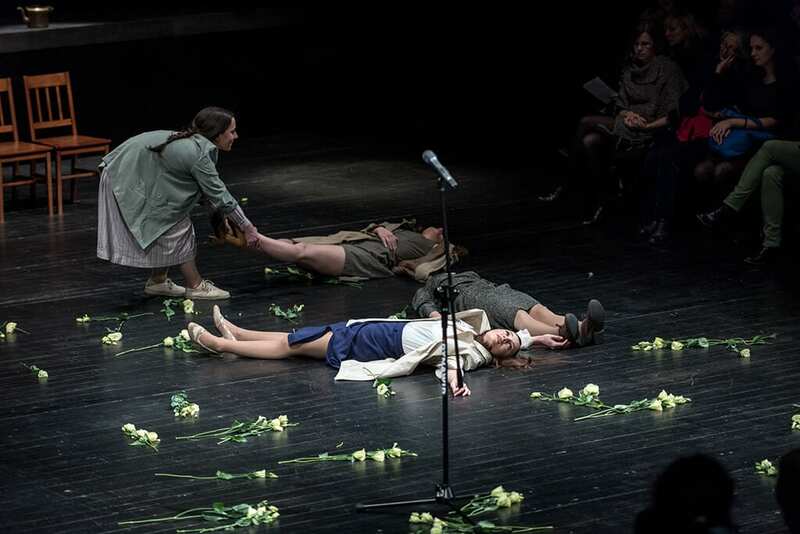 Through his fresh approach in combining Eurypides’ tragedy with real life stories collected in interviews with war survivors, Tavadze manages to emphasize the universality of the play. There are no names or countries mentioned so it is much easier to identify with the women on the stage. The use of Andromache’s monologue which she is forced to repeat over and over again until she breaks down, is extremely powerful and heartbreaking to watch. It shows how women are repeatedly manipulated and victimized by politicians in order to raise the morale of the men – the heroes. 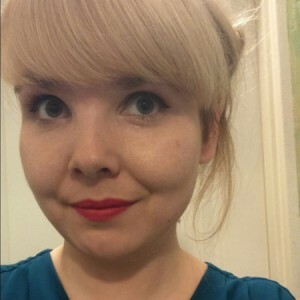 However, men are not true heroes here. Tavadze clearly points out that daughters, wives, mothers and grandmothers should be perceived as heroines. Throughout the performance the actresses almost never stop smiling. At first it is quite disturbing, as the stories told by them are extremely painful and moving. However, as the play progresses everything falls into place. The women smile because they are no longer able to cry. Their grief is so unimaginable that they are beyond tears. Tavadze in a quite clever way presents how the women, despite being physically alive, are not able to escape death themselves. In of the scenes, in one particularly evocative scene, each actress, following a short monologue, is arranged by another into a corpse-like pose. The women lie on the ground with their eyes open, looking directly at the audience. It is a very simple, yet powerful way of showing how extremely traumatic experiences can leave you dead inside. Despite all the pain and sadness, the play is a hopeful one. These women’s stories are not solely about death but, above all, survival. They are told to remind us of the atrocities of war and, at the same time, to help in the healing process. The latter can be clearly seen in a scene depicting a silly children’s game in which one person calls out a chosen colour while the rest have to find it somewhere, including in the audience, and touch it. The game is intertwined with five stories of five different women. In this way, a simple game becomes a form of therapy by which the most harrowing moments of the war may be expressed. It helps teach how to move on and live fully again. Women of Troy touches upon the central yet often ignored issue of women in wartime. In a thoughtful and hauntingly beautiful way, the production presents a real struggle with grief, mourning and hope for a better tomorrow. It is both extremely well written and well executed. Not only does the director, but also the five young actresses involved deserve to be praised. They were able to find the balance between raw emotions and restraint which makes “Women of Troy” worth seeing. A well written and thought provoking review about an intriguing production. Thank you, Ms Kotapska, for the reminder of how timely and instructive the classics can be, and for highlighting this method of bringing their power to bear on contemporary issues.